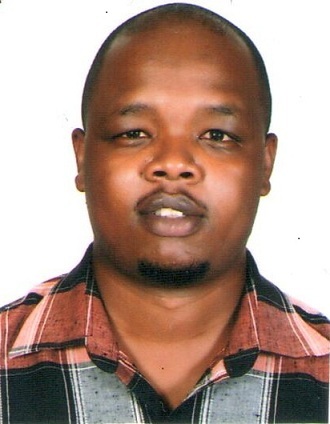 The devolution of powers from Kenya’s central government to its 47 counties has been a policy priority in the country since 2013 when the counties were established. One of the central elements behind this push was the localisation of development activities behind poverty eradication. Five years later, the country is taking stock of what changes have been made since devolution started. 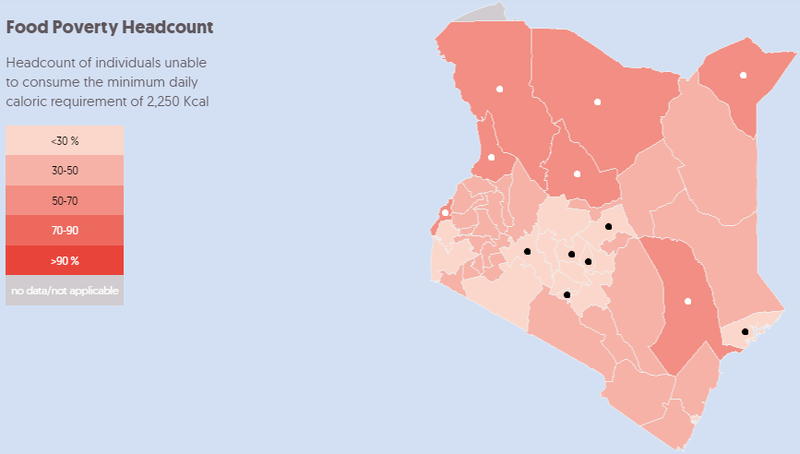 Spotlight on Kenya, our interactive online data visualisation tool, can be used to explore key statistics on people across Kenya’s counties. We have recently updated the tool with data from the 2015/2016 Kenya Integrated Household budget survey (KIHBS). Using this data on a range of indicators including poverty and food poverty headcounts, we can gain insight into the varying challenges and needs of people living in each county. Where are people most affected by poverty? The top-line statistic carried by the Spotlight on Kenya is poverty headcount, the percentage of people in the county living in poverty (based on the national poverty line). A quick look at the statistics highlights noticeable positive changes in the counties that recorded the highest poverty headcounts during the last survey in 2005/2006. Notably, Kwale, Wajir and Narok reduced headcounts by 23.3%, 21.6% and 18.4%, respectively. However, six counties regressed (Table 1). In 2015/2016, people in Nairobi were the least likely to be living in poverty, with the poverty headcount standing at 16.7% of the population; at the other extreme, there were eight counties where more than 60% of people were living in poverty (Figure 1). Residents of Turkana, Mandera and Samburu were most likely to be affected. Poverty headcount, however, is a measure of the incidence rather than the depth of poverty; the poverty gap indicator captures both – it represents the mean shortfall of the population from the poverty line, expressed as a percentage of the poverty line. It can therefore help us to put the poverty headcount figures in a little more context. The animation below in Figure 2 compares the two maps, and the ranking table (which is displayed for every metric in the Spotlight) demonstrates that while Nairobi is home to a lower percentage of people living in poverty, Kenyans living in Nyeri are closer to the poverty line on average. Residents of Turkana, Mandera and Samburu, once again, were likely to be most affected by deeper poverty. Turning to food poverty, the Spotlight shows a strong correlation between poverty and food poverty headcounts, as seen in the animation below (Figure 3). The comparison highlights how overall poverty bleeds through into a lack of access to the basic resources required by all people. Overall there were seven counties where more than half of the population was unable to consume the minimum daily caloric requirement of 2,250 Kcal; these are marked with a white dot on in Figure 4. The lowest rates of food poverty, marked with a black dot, were identified in Nyeri, Meru (both 15.5%) and Nairobi (16.1%), with Kirinyaga (18.8%), Nakuru (19.6%) and Lamu (19.9%) also scoring below 20%. How can the data help us to explore need? Mean per person expenditure reflects the average amount of money (in Kenyan Shillings) spent by people in the county every month; it tells us something about the economic choices people are making, and about the cost of living as determined by policy and market forces. It therefore provides a context for the poverty statistics, particularly when we are interested in the needs of a county’s people as well as the challenges they face. In Nairobi and Mombasa, average monthly spending exceeds KES10,000 per person (KES14,311 and KES10,970, respectively), and in six further counties the figure is over KES8,000 (marked in white on Figure 5). This is in strong contrast to Mandera, where average monthly spend is only KES3,461 (less than a quarter spent in Nairobi; marked in black on Figure 5). Wajir (KES3,784), West Pokot (KES3,914) and Busia (KES3,924) are also marked in black below, and saw spending under KES4,000. The relationship between expenditure and food poverty also makes for an interesting comparison, as highlighted in the animation in Figure 6. 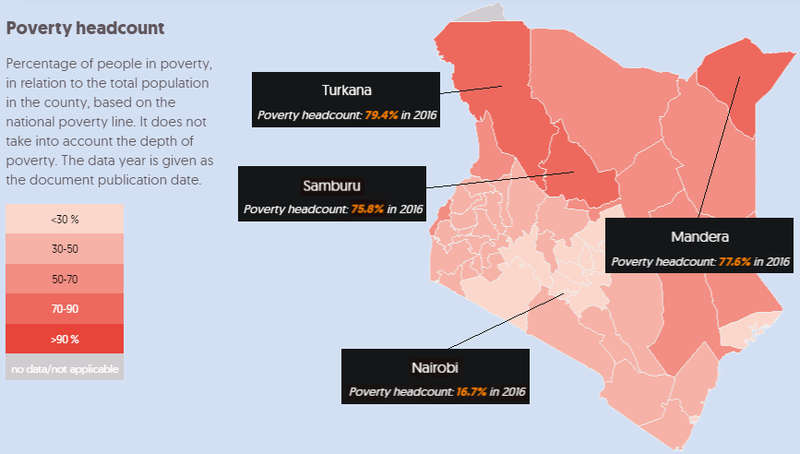 The 2015/2016 data paints a picture of improvement, seeing poverty drop by 10 percentage points nationwide; however, it also points to uneven development across Kenya, with pronounced disparities between the needs of Kenyan citizens in different regions. The devolution process aims to empower individual counties with the necessary powers to address the challenges they face, but in order to do so effectively policymakers should make best use of the clear and impartial data available to them. 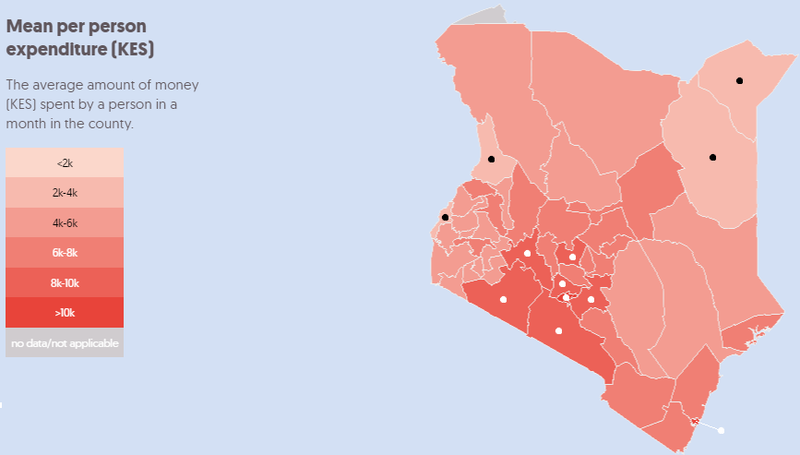 Our Spotlight on Kenya not only presents the most recent data on poverty and vulnerability, but also extends to figures on population, education and health derived from previous records that provide an insight for policymakers working in specific areas.